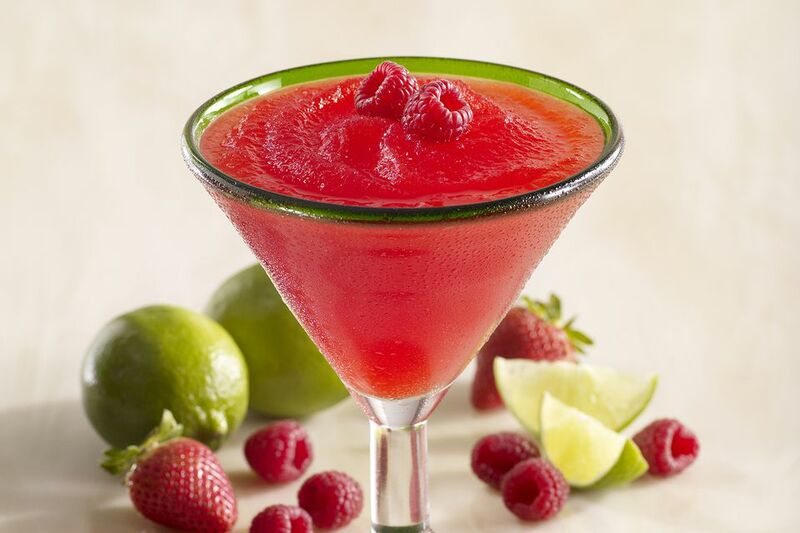 Fresh raspberries make this raspberry margarita special. It's a fantastic tequila cocktail to enjoy during the summer or any time of the year when you want a delicious, fresh, and fruity margarita. This raspberry margarita mix is very easy. All you need to do is toss the ingredients into a blender and fire it up. In just a few minutes you will have a great drink. If you like, you can also shake it and serve it 'up' or on the rocks. When making this or any Margarita, be sure to choose a decent tequila. Most of the time, a Blanco tequila will be your best bet, though a reposado is not a bad idea if you choose to shake it. If you're hosting a party you can blend up a large batch of raspberry Margaritas ahead of time. Simply place the blended cocktail in the freezer until it's time to serve and enjoy the blender-free party atmosphere. You can also skip the fresh berries and shake up Raspberry Margarita with a raspberry liqueur like Chambord or crème de framboise. A homemade raspberry syrup is also easy to make and it can be the foundation for making your own liqueur. Use about 1 ounce of either ingredient along with the tequila, lime juice, and triple sec as called for in the recipe. You can also use the recipe to create fruit medley margarita by adding other berries like blackberries and chopped strawberries. It's very easy to make small changes like that to blended cocktails and creating new drinks on the fly is half the fun of making them yourself! Skip the Blender: It's very easy to adapt this frozen margarita into a shaken version and all you really need to do is skip the blender and extra ice. You can even get away with about 1/4 cup of raspberries because it's a rather juicy little fruit. When using fresh raspberries, muddle them in your cocktail shaker before adding the rest of the ingredients and filling it with ice. To use frozen berries, allow them to thaw out before muddling and shaking. If fresh raspberries are not available, frozen will do. You don't have to rely on the grocer's freezer section, either. Take advantage of the fruits while they are in season and freeze them yourself. This will allow you to enjoy the freshest margarita possible year-round. Whether you stock up and buy a bunch of berries from the market or grow your own, raspberries freeze very well. All you need to do is fill a freezer bag with the whole fruits and place this in the freezer. When it's time for a margarita, simply break off a chunk of berries and add them to the blender. The nice part about this fruit is that all of those little pieces of the whole fruit break apart. This allows you to quickly break off as large a chunk as you need from the frozen block of berries. How Strong Is the Raspberry Margarita? The nice thing about blended cocktails is that all the ice transforms it into a rather light drink. When made with an 80-proof tequila, this recipe weighs in at just over 7 percent ABV (14 proof). In comparison, if you were to shake the drink with the exact same ingredients, it would be around 20 percent ABV (40 proof).